Clavicus Vile is a Daedric Prince whose sphere is the granting of power and wishes through ritual invocations and pacts, and is the master of Barbas, a powerful shapeshifting hound. He is part of The Triad, alongside Mephala and Nocturnal, a group of Princes who seek to start a Daedric War, and did not sign the agreement preventing Daedra from manifesting on Tamriel. For more information see the lore page. Clavicus Vile is encountered as the main antagonist of the Morrowind main quest, where he seeks to locate the Clockwork City. He is also featured in the Stillrise Village objective quests. He often manifests as a cloud of red mist called the Voice of Clavicus Vile. His Daedric soldiers are the Skaafin, yellow-skinned humanoids of various sizes that have horns and red eyes, and his realm of Oblivion is the Fields of Regret. War Chief Helushk will give you a key to the Odious Chapel and instruct you to offer the Vacant Daedric Soul Totem to the blood fountain of Clavicus Vile. After doing so, the Prince will communicate to you through a red mist and say "You bear a gift? How thoughtful! But I can't accept it without providing one of my own." You will begin to kneel in pain under Vile's influence and he will say "I know! I'll share the same gift I gave Stillrise Village. Now you can play skeever-wicket with your own skull! Hahaha!" and give you the "Curse of Stillrise", turning you into a skeleton. Regardless of each choice, he will then say "Now begone." Barbas: "Master, I'm close to our goal! 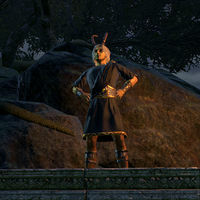 With Vivec's energy, I can open a portal and..."
Clavicus Vile: "Pray this works, my hound, for you interfered with a plan that wasn't intended for the likes of you." Barbas: "I'm so close, Master! Soon the secrets of Sotha Sil's city will be yours!" Clavicus Vile: "Get on with it, dog! Grant me access to the Clockwork City and I'll reward you a thousandfold!" Barbas: "Master, why do you bother with partners when you have such a faithful servant in me?" Clavicus Vile: "Questioning me, Barbas? Again? Have you learned nothing from your last banishment?" "How dare you discipline my dog? He was only trying to appease his master. And I'd never harm a hair on whatever insignificant creature you hold dear. You, on the other hand, require a lesson in manners…." Barbas tried to kill Lord Vivec and destroy Vvardenfell. "Indeed? What ambition! As you can see, Barbas isn't a bad dog. He does get easily excited and overzealous. He embellished my plan somewhat, but it all worked out in the end. And we found the Clockwork City." So you were trying to take control of Clockwork City? "This little flea thinks it's smart, but my plans are beyond its comprehension! Still, by delaying the inevitable, you caused my associates and I some trouble. You'll stay here until you're no longer a threat. How does a few decades sound to you?" No thanks, I think I'll find my own way out of here. Clavicus Vile: "Quiet, dog! Haven't you—wait, who dares intrude upon my lesson?" Barilzar: "Found you! Over here... oh. Clavicus Vile. This isn't good." Clavicus Vile: "Begone, meddling wizard!" K'Tora: "A bargain is a bargain. The island for the Heart of Transparent Law." Clavicus Vile: "Yes, yes, just as we agreed. But only a portion of the crystal. We don't want to alert the Sapiarchs too soon." K'Tora: "Tell your fellow Princes all will be well. The Ritemaster is no match for my mind magic." Clavicus Vile: "So Nocturnal has assured me. Don't disappoint us, K'Tora." Clavicus Vile: "Look, Mephala! The mortal hid the heart inside his own body! How clever!" Darien Gautier: "Uh-oh. Mephala and Clavicus Vile. This could be bad." Mephala: "But why did Nocturnal keep this from us?! No matter, I'll take the heart now, Ritemaster." Clavicus Vile: "Impressive for a mortal, but the wards won't hold for long against our power." Ritemaster Iachesis: "They're … tearing me … apart!" Clavicus Bile: "Stop that, Mephala! I've got him! Wait … what's—?" Mephala: "Nocturnal?! How dare you interfere!" Nocturnal: "Get out of my realm, Princes!" should the end bit of this scene be added here? In the Vaults of Heinarwe, and make your way to where Clavicus Vile wants to meet you. When you finally arrive, you will be greeted with the sight of Clavicus Vile brutally murdering his loyal cultists. A poor sod named Alderdon gets this treatment last, and his corpse is subsequently possessed by the Prince of Bargains in a burst of red light. Clavicus Vile will depart, and the corpse of Alderdon once again slumps on the floor. The Nycotic Cult believe that they worship a mysterious god called "Nycot", but in reality it is actually Vile's name mistranslated. During the quest Deepening Shadows, the Whispering Sorcerer will say that Clavicus Vile has broken a pact with Nocturnal by granting Chancellor Gascone Dusant sanctuary in the Ventral Terminus, which he has overrun with Skaafin. This page was last modified on 31 March 2019, at 23:15.